OXI DAY 1 (learn more): October 28, 1940 - "NO!" What Greek Prime Minister Ioannis Metaxas said to Benito Mussolini at the start of World War 2. Of course, Hitler had to help his Italian ally out by occupying Greece for nearly 4 years afterwhich Greece had a brutal civil war, Greek Loyalist vs. Greek communist. Democracy Prevailed. Incidentally, Greece was only one of four countries to side with the allies in both World Wars. OXI DAY 2: July 5, 2015 - "NO!" What the Greek people voted today, in no uncertain terms, out-loud to the Eurozone, the International Monetary Fund, Germany and the world. No, we won't take anymore economically crushing austerity measures to try to pay back a our staggering debt load. Now what? No one truly knows, but we know that kicking Greece out of the European Union would not show, well, any kind of national European unity. Will the United States kick out Puerto Rico (part of the US) when it defaults on its debt by year's end? Probably not. The US can print its own money. Greece cannot so, yet. Why does that make a difference? Well, for perspective, the United States has a larger per capita debt than Greece. However, Greece (as a member of the EU) cannot print money like the U.S. can. Of course, the US has the economic machine to possibly grow out of its debt, but we doubt that's really possible. 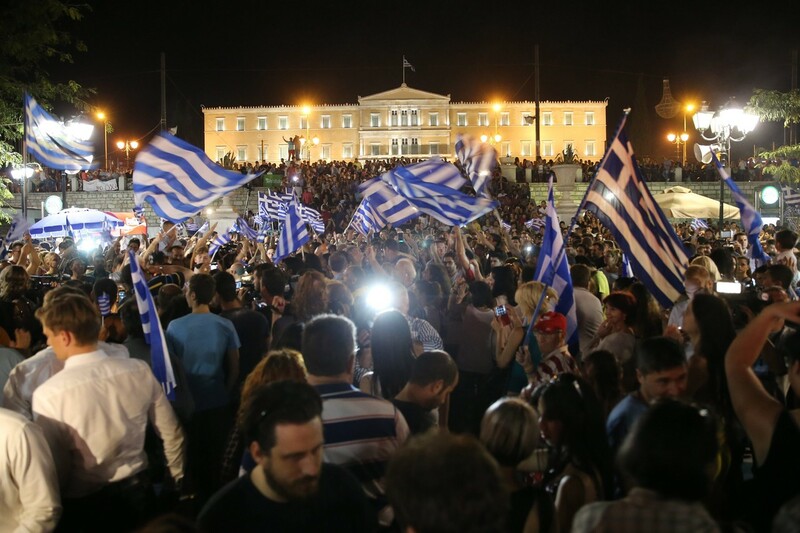 Greeks voted today more for reasons of pride rather than economics. When Odysseus in Homer's Odyssey was confronted with two poor choices: 1) Face the man-eating, multi-headed monster monster Scylla (and lose a few of his men); or, 2) Face the whirlpool Charybdis and lose all his men, his life and his ship. He chose the lesser of two evils (choice 1, of course). Today the Greeks chose what hopefully will be the lesser of two evils. They didn't want to fear life again under an essentially economic German noose as they literally suffered in mass during the WWII German occupation (additional 250K died of mainly starvation). Like any era or civilization that is ending, the common people don't simply disappear. However, some do end in genocide as the Greeks suffered in 1922 (nearly 1 million) at the hands of the Ottoman Turks (Watch The Greek Holocaust: 1915-1922). Also, some end in Civil War as the Greeks endured in 1946-7. The Greeks are a people who have suffered much and survived leading to what many unaware outsiders perceive as mass dysfunctia. Just another chapter in the long - very long - history of Greece. What the Greeks have bought themselves is, at least, a new bargaining chip in this high stakes poker game with the IMF, Germany and the world. We don't believe the EU will continue without Greece. Maybe Greece was only 2% of the GPI of the EU, but what will happen when the next country in line makes headlines (Italy, Portugal, Spain, etc.)? How big is too big to fail? This whole situation is personal now, not economic. Greece, the future perceived underdog vs. Germany/EU, the future perceived bully? Will the EU kick Greece as if it were a injured dog? Do you kick Grandpa out of the family? We believe Greece will be the prodigal country to the EU family. The Greek Phoenix will rise to live again, but then Greeks live everyday for today. Something that many of us obsessed with money, a man-made invention (Greek, of course) often forget. Whatever the outcome, we wish the common people of Greece a peaceful, smooth and fruitful transition to the next chapter of their gloried history. In good times and in bad, we remain CelebrateGreece.com.